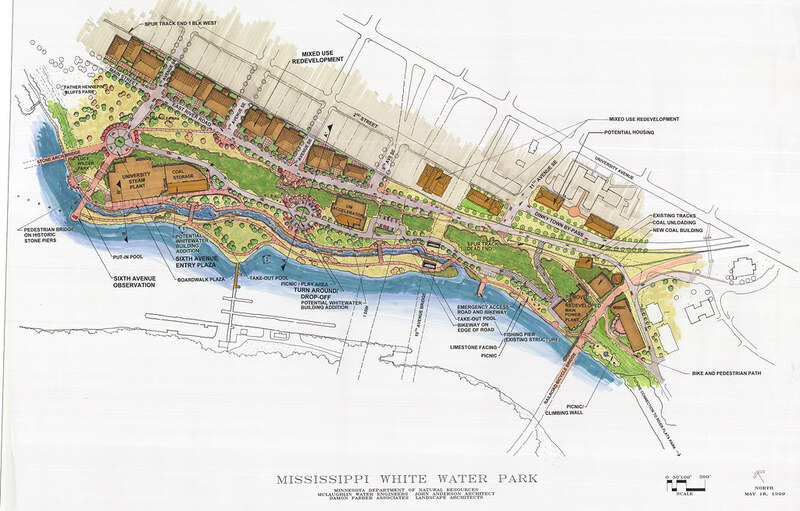 There are a few factors that provide the basis for a whitewater park project. Reviewing them will help you determine the scope of your project, and will enable to help us determine how we can best meet your objectives. Water Volume – How much water (flow rate in cubic feet or meters per second) are you planning to accommodate? What is the ideal level for recreation for your project? As you might guess, the larger the channel and the volume of flow, the more complicated and costly the project. It is easier to build diversion structures designed to manage 500 cfs than 10,000 cfs. Fluctuation – Your river probably fluctuates during the year. What are the low and high flows, and in how much of that range do you want your artificial or enhanced river features to function? Let’s extend the previous example. Designing a whitewater course that will be useful between 500 to 1,500 cfs is different than addressing a river whose average annual fluctuation is 500 to 70,000 cfs and whose users have an expectation that the whitewater course will be useful up to 30,000 cfs. Length – How long will your course be? Do you need the length of a slalom course so that it can be used as a future race site? Do you need a site long enough to allow slalom paddlers and freestyle paddlers to train simultaneously? Do you want beginners to have a section in which they can learn basics while intermediates hone their skills on larger features? Depth – How deep do you want your course to be? If your project will be used by inner tubers, squirt or freestyle boaters, consider your required minimum and ideal depth in the rapids, in eddies and through the pools. Flexibility – You may be interested in features that can be adjusted. We can deliver! We offer Wave Shaper technology by which you can modify the characteristics of drops and create a variety of types of rapids without shutting off the flow. If your project requires fixed features we can provide variety through features that change predictably with flow fluctuation and/or by building multiple drops that perform at different flows.